Disclosure: This post contains affiliate links and I will be compensated if you make a purchase after clicking on my links. I was also compensated for this post. Read full disclosure here. I have teamed up with Gymboree for their "Made You Smile" campaign, where they ask what makes you, your family, and/or your kid smile? It is the little moments with my husband and daughter that makes me smile. Like watching my husband play with our daughter, Little Moon, and hearing her laugh, or when he reads her a bedtime story, and she thinks the fish in the book is a ball, so she keeps pointing at it and saying "ball" (in her defense, it is a really round fish!). What makes my daughter smile? Going the playground makes her smile. She is more interested in the wood chips than the play equipment though (she is carrying a woodchip in the photo below). She recently has started showing an interest in the tunnel and slide, so we are making progress! By the way, my daughter loves this shirt from Gymboree! She pointed at it and kept saying "cat" over and over again. She loves our cats and tries to play with them, but they aren't a fan of her and often run away! It's okay because the dog will play with her. They are best buds, and they make each other smile! (The leggings are also from Gymboree). Reading and looking at books also makes my daughter smile. She never really stays on one page long enough for me to finish reading it to her, so I mostly just point at the pictures on the page and say what I am pointing at. She loves to point at pictures to own and have me tell her what it is. Below she is reading "Animal's Under The Bed!" by Meg Smiley. You can't see it well in this photo, but her shirt says "You, me and a good book." The perfect outfit for story time! This set is also from Gymboree! Want to know what else makes me smile? Gymboree's new clothing line! Gymboree asked modern moms want they wanted for their children's clothes and the results are amazing! Their new "Made You Smile" collection features clothing that is more comfortable (so soft! ), more durable (perfect for the playground! ), and versatile (never have to worry about matching again! ); making their clothes the perfect choice for back to school! We were always fans of Gymboree as their clothing was always cute, modest, and good quality, but are loving the new line even more! I just can't get over how soft her new clothes are! Plus they are so durable and so far have survived our trips to the playground! Gymboree offers free shipping Over $50 + free returns! What makes you or your child smile? Feel free to share in the comments! Wow what a cute tee! I love a line of clothing that's not something you see on everyone. Will definitely check this one out. Aaaw!It is the little memories in life that make me so happy as well. Anyway, such a pretty baby, she looks so joyful when it comes to her playing.Even reading books? Aaaw!I'm in love! The little girl is very cute - and I love that she's 'reading' a real book...!! I love your little girl’s outfit in the first photo. It is super cute. My kids love reading and playing games. Makes them happy. Thanks! That's great they love reading and games, both are great for brain development! Thank you! And yes their new clothes are amazing! 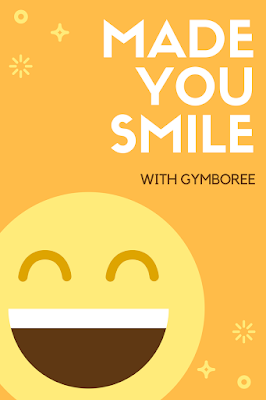 Gymboree's "Made You Smile" campaign is so unique. Smile is infectious and through out reading this post I had a smile on my face seeing how creative they have been when launching a new campaign for associated kids products. What an adorable collection Gymboree has. Your daughter is cute and her outfits are cute as well. What makes us or our child smile? is the question we need to ask ourselves everyday for encouragement. This makes me wish my kids were little again. Gymboree has the cutest stuff! The little subject of these photos is adorable too! LOVE this post. I don't have a little one but I have a baby sister and she certainly makes me smile. It's been soooo long...but my kiddos all wore a TON of gymboree when they were little. Always so cute, and always great quality!! !